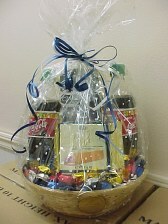 We are pleased to offer to those in the apartment industry and other corporate interests, our line of welcome baskets. 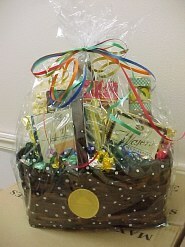 These baskets are perfect for move in gifts, renewals and above all those dreaded OOPS! Gifts. Variations in product and color are no problem. They can be geared towards your colors or coordinated with the seasons. Net 30 is available for those who qualify. 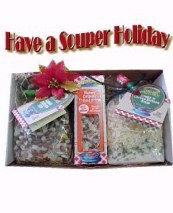 Free delivery is available with orders of 15 or more to one location. 10% discount on December orders of 15 or more placed before November 1st. 5% discount on December orders placed of 15 or more placed before November 15th. toilet paper and candies in a 10" fruit basket. Coke, cappuccino, popcorn, cookies, summer sausage, cheese, crackers candies in a 10" fruit basket. popcorn, nuts, two cookies, granola bar and Peerless candies in a walnut basket. 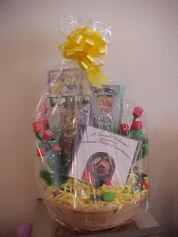 popcorn, nuts, two cookies and Peerless candies in a walnut basket and a customized chocolate CD. The cover of the CD is designed specifically for your company and can include your logo. 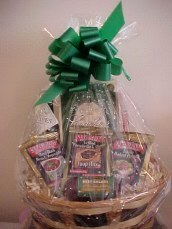 popcorn, nuts, two cookies, summer sausage, cheese, crackers, mustard and Peerless candies in a walnut basket. 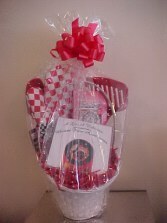 A pretty princess basket complete with oven mitt, spatula and spoon, Fireside coffee, biscotti and a customized chocolate CD. Contents will remain the same, however, color and style may vary according to supply. 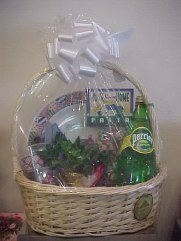 A very nice basket complete with two Home Sweet Home Plates, two place settings of flatware, Home Sweet Home pasta with sauce mix, dish cloth, two glasses, water, salt water taffy and ivy. A splendid home coming.